This town is a valley situated between the hills and the sea; cruise through meandering canals and gaze upon carpets of lush green paddy fields on either side. You will also have the opportunity to enjoy breathtaking sunsets and sunrises with unhindered views too. Being the major center of paddy production, it is often called the ‘Rice Bowl’ of Kerala. Called The Venice of the East because of the intricate system of canals still used by people to navigate every day, Alleppey is probably the most scenic of the backwaters. You can spend a relaxing day and night in charming houseboats that serenely sail along. You will pass homes with steps leading into the water, and their boats tied to pegs; some even have their own private jetties. This is one of the rare places in the world where below-sea-level harvests take place. 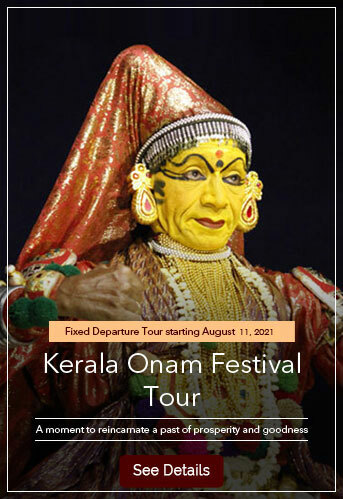 The Nehru Trophy snake boat race, held annually close to the Onam Festival, is renowned internationally. This tiny town is a tourist paradise with its beautiful Kumarakom island, sitated on the banks of the Vembanad lake; there are several tiny isles as well, and backwater cruises are extremely popular here. ‘karimeen pollichathu’ – a delicacy of pearl chromide fish, marinated and wrapped in banana leaves and then slow-roasted, is the most famous dish of this region. If you’re a fish eater, your houseboat staff can catch one fresh from the backwater and cook it for you! Enjoy the spectacle of vibrantly colored birds and flowers as you cruise along. Cherai Island is a popular destination with swimmers. Dotted with coconut beaches, this typical tropical paradise also has several backwaters criss-crossing each other. 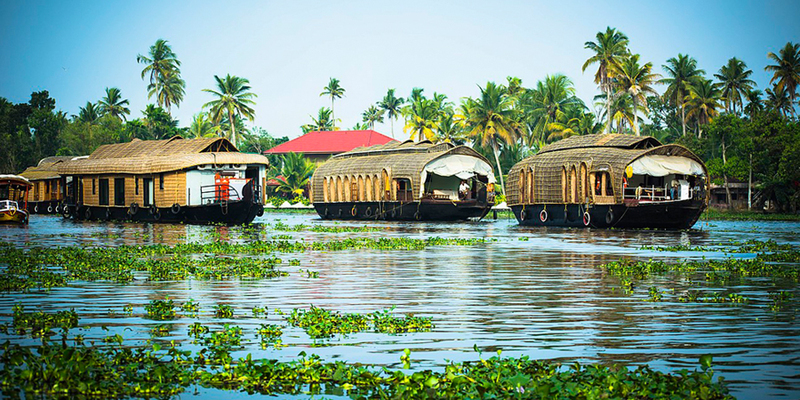 Apart from the exotic landscape, a cruise along these backwaters will also reveal the rich and versatile culture of this town. Cruising along the Kasargod backwaters, you can marvel at the number of forts that dot this place. 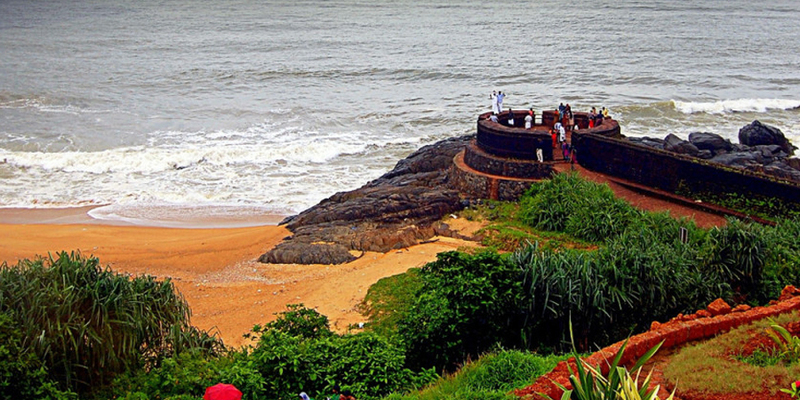 Enjoy the diverse landscape filled with rivers, mountains, beaches, and plant varieties quite different to what you see in other parts of Kerala. 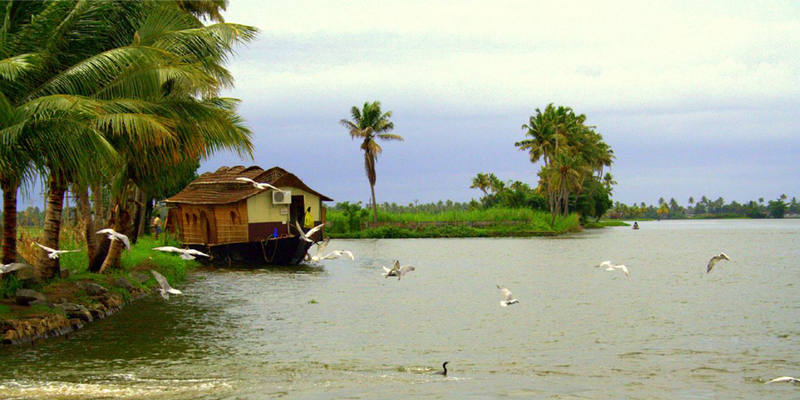 Head to the backwaters of Kollam if you desire tranquility. Enjoy the spectacular landscape while sailing on the traditional boats called ‘kettuvalloms’ , and feast on traditional Kerala meals, called ‘sadya’ as you cruise along sedately among the calm backwaters. 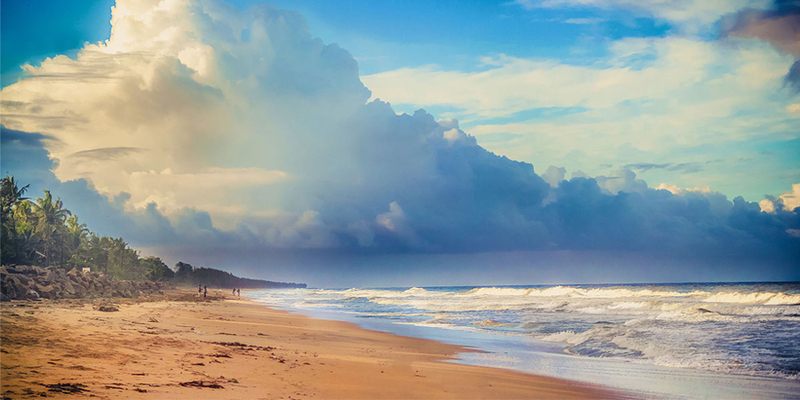 A bustling port and commercial center since ancient times, Kozhikode sees less tourists but has much to offer visitors; its backwaters are still quite pristine, and you can enjoy Nature at her best. 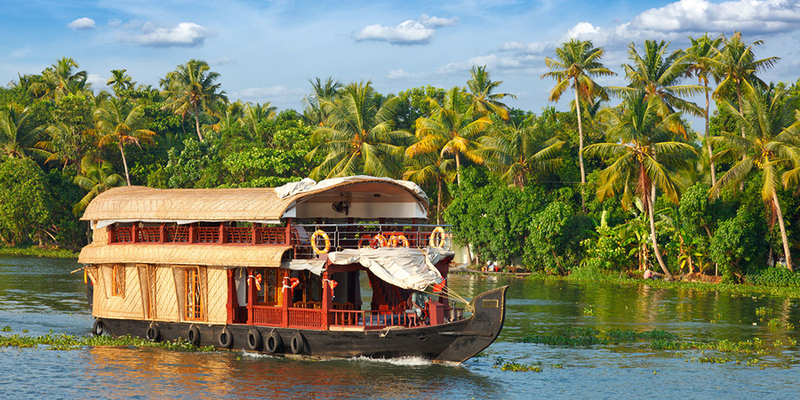 Numerous palm fringed canals, lakes and rivers offer delightful sights to visitors cruising on houseboats. ‘Uru’ – traditional handmade ships, are still made in the Beypore region, and you can get an up-close view of these as you cruise. 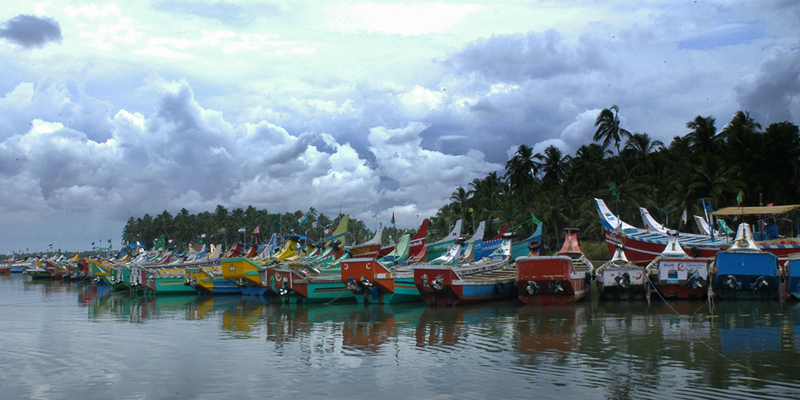 The city is the second largest in Kerala and is renowned for lip-smacking food which you can enjoy on a stopover. Regardless of whether the outer designs of the houseboats are traditional or modern, all of them are usually well furnished with modern fittings and European-style bathrooms to ensure your comfort. 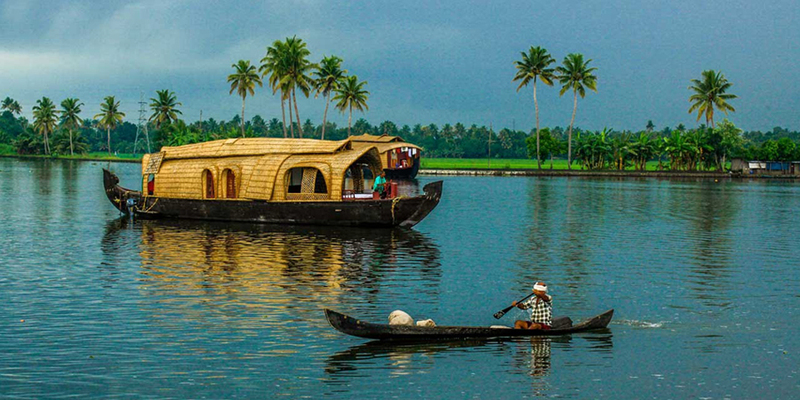 The best time to visit Kerala for backwater cruises is from September to March; the Monsoon fury would have subsided and the hot summer not yet has begun. Previous PostPrevious Experience India during the famous cultural festivals!